In business, it is the owner’s responsibility to make sure the needs of their customers are met efficiently and effectively. Example 1) Yesterday I was in Target and I needed batteries. The batteries were located in the Electronics section of the store. Coincidentally, the majority of interactive toys need batteries. Right beside the Electronics section, were rows and rows of toys. And beyond this Toy section was the Grocery section, where the candy was strategically placed right across from the toys. Efficiency and effectiveness is the name of the game. They had moved the battery section to meet the customer needs. Batteries are needed in toys, and candy attracts children. No running around the store to find the candy or the batteries or the groceries for that matter; everything in one spot so you just walk from one section to the next. And the owner can benefit from a parent giving into a child’s impulsive toy or candy desire every now and then. Example 2) I ate at a Ruby Tuesday's Restaurant recently. Times have changed as health and nutrition have evolved. People want smaller portions and healthier options, including myself. To fit into the customer needs, Ruby Tuesday's has adjusted its menu to provide nutritional values, healthier food choices, and the option of smaller portions. My food was cooked in the manner requested, as I asked for things to be left out and added. Ruby Tuesday’s was willing to prepare my food with flexibility, and they gained a satisfied customer who is willing to come back. These two businesses are a lot like the business of education. Of course, education does not involve batteries or food. What is does involve, is effort. Effort is made to work effectively and efficiently within the needs of their customers (students). Many times I hear, “Well, I wasn’t taught that way and I learned just fine!” “I wasn’t taught with technology and I turned out alright!” Just as Ruby Tuesday’s and Target illustrate, school is not about the teacher (store owner) or what the teacher (store owner) wants or needs. It is about the children, our customers, and what they need. Evaluate students' requirements for success. Take a look at their needs, even if they are tech-related. Give them the tools to thrive and perform to their potential in an age where technology does rule. Take the time to not only become aware, but trained, in the technology tools that can give your customers – your students – a leg up in future careers. Think about their requirements in correlation to the tools and efficiency you provide. Analyze your effort. 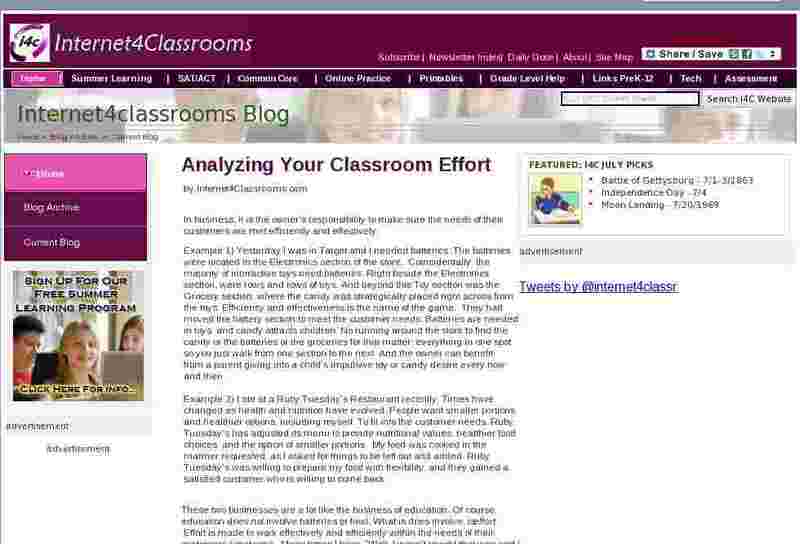 Do you run your classroom according to *your* needs, or according to your customer needs?